Small Sanding Belt Holder for LathesVery easy to use! The MST-SBH 1.0 tool will allow a safe sanding on lathes. It protects the operator; eliminating the risks associated with the use of his hands. Small Sanding Belt Holder for Lathes Very easy to use! 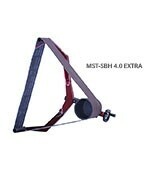 The MST-SBH 4.0 tool will allow a safe sanding on lathes. It protects the operator; eliminating the risks associated with the use of his hands. 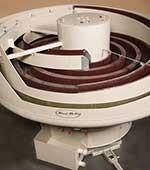 The Versa-Flow Spin-Finish Machine is a very high energy finishing system. The machine uses a spinning tub of media and processes parts that cannot have part-on-part contact; are high value parts; or for which a lean manufacturing single part flow is needed. 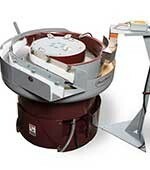 The Roto-Max® Revolution is a new patented “all-in-one” machine from Hammond Roto-Finish. The Revolution features the RM-2 or RM-6 centrifugal disc section integrated into a machine that has one main moving pivot point. 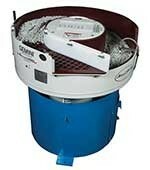 The Roto-Max® line are a series of centrifugal energy machines. The machine functions with a rotating disc or spinner in the bottom of the finishing chamber, and a stationary wall that the rotating disc meets with a precision gap. 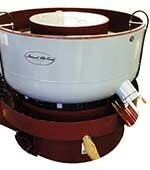 Vortex machines feature an integral drive. This drive offers lower maintenance, higher frequency and a faster process time. The V-Max® series vibratory finishing machines's main component is the certified pressure vessel that forms the bottom of the bowl, with the completed weldment the bowl structure is a “dome”. The weldment design and vibratory drive design allow the V-Max® bowl to operate at speeds no other vibratory bowl can match. Multi-Pass machines are unique in the mass finishing industry. Multi-Pass features internal separation keeps the process media inside the process chamber and can operate in a continuous operation or it may be used as a batch process machine. 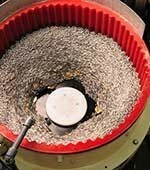 The HR Spiratron® Flat Bottom machines are ideal for large component finishing. Used for batch processing, the machine is loaded and unloaded by piece by hand. The HR Long Radius Combo Series features the same structural design as the HR Long Radius Series machines, but also adds a second chamber for parts drying. 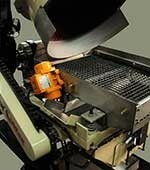 With unload gates available for both the processing and drying channel this is one of our most versatile machines. 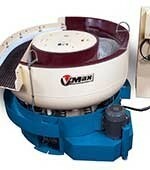 Montfort International Ltd. offers a wide range of tribofinishing and sanding machines to meet all your special needs. Inspired by nature, tribofinishing is an industrial technique that uses friction to obtain smooth surfaces. Use of consumables / abrasive media, water, chemical additives and especially centrifugal energy machines or circular vibrators that generate the movements to polish. Increase your productivity with advanced finishing and deburring systems that will help you cut costs and reduce labor time for parts preparation. With this equipment, you can deburr, polish, smooth and clean. Renowned for their efficiency, our tribofinishing machines will meet all your needs. 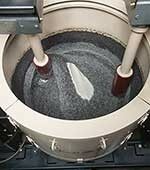 Our circular vibrators can be used for fine finishing, polishing and creating special finishes before plating. Avoid accidents when sanding with our sanding devices that allow you to perform your operations without the direct use of your hands. 100% Québec Innovations, our sanding tools for metal or wood lathes allow the maintenance of abrasive belts for sanding, polishing and deburring operations during sanding operations of metal parts, alloy or wood. Avoid accidents when sanding or deburring by performing your operations without the direct use of your hands. We also offer efficient and safe inside polishing attachments for sanding, polishing and deburring on conventional lathes. Ask for a lab test profile now! Fill this PDF form and send it to info@montfort-international.com. Since 1989, Montfort International has been the partner of choice for industrial and manufacturing companies, increasing the efficiency of their processes and the quality of their products. © 2018 Monfort International. All Rights Reserved.